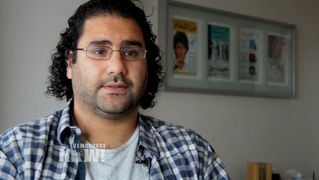 Robert Fisk: Obama Administration Has Been Gutless and Cowardly in Dealing with the Mubarak Regime | Democracy Now! Robert Fisk, longtime Middle East correspondent of the The Independent newspaper in London. He is the author of several books, including The Great War for Civilisation: The Conquest of the Middle East. AMY GOODMAN: By the way, you can follow Sharif’s tweets at democracynow.org, our senior producer on the ground at Tahrir Square in Cairo, and as well as the blogs and the latest reports. We reached Robert Fisk just hours before the broadcast and asked him his reaction to the unfolding events in Egypt, as well as the U.S. response. ROBERT FISK: Well, immense courage displayed by those who are demanding the overthrow, effectively, of Mubarak, oddly matched by the complete gutlessness of the U.S. administration. In fact, the cowardice of the language coming from Mrs. Clinton in the State Department, the endless calls for restraint and the endless calls of Mubarak being a friend of America, etc. — Mubarak himself being a dictator, runs a secret police state, in effect — against these lone Egyptians who are being filmed by state security, who are being filmed on television around the world, who are giving their names, identifying themselves as being against the regime, it’s been an extraordinary example of lost American opportunities, in fact. You know, I’m on the street with these people. They’re not anti-American. There are no anti — nobody is burning American flags, though I probably would if I was among them and I was an Egyptian in these circumstances. They’ve been immensely understanding of the international situation, but of course immensely betrayed. What they’re buoyed up with is basically a simple fact. When you throw constant humiliation and fear and repression and increased education, when you throw off your shackles, as the old cliché goes, when you say, “I’m not afraid anymore,” you can never re-inject a people with fear. They’re on their feet. They may get defeated temporarily, but they’re still going to be standing up. And that’s why more and more people are coming to join the protesters. And now what we’re seeing is that having shown their defiance of the state security police on Friday of last week in those big battles in Cairo, having now had to fight literally against the Mubarak people with stones — I mean, literally fight and be wounded — they’re showing that their courage is real. It’s not just voices on a screen that are going fade back to middle-class homes later or go back to farming or something. It’s the real thing. And this is something that Mubarak clearly doesn’t understand. I think the army is beginning to. The key that I’ve seen over the last few days has been the way in which the army on Friday was told by Mubarak to clear the square, and the individual tank officers refused. I actually saw them tearing off their tank helmets, where they were receiving orders on their own military net, and using their mobile phones. And in many cases, they were phoning home, because they come from military families. They wanted to know from their fathers what they should do. And, of course, they were told, “You must not shoot on your fellow citizens.” And that, I think, was the actual moment when the Mubarak regime broke. Or if we look back historically, that’s what we’ll believe. So I think it is broken, it’s finished, whatever Mr. Mubarak may dream about in his pantomime world. And I think that was a very critical moment. Now, of course, the great drama is this. The Americans want the military to control the situation and get rid of Mubarak, but then are we going to have Mubarak’s vice president? Are we going to have an Egypt led by the former intelligence officer for Mubarak, a chief negotiator with Israel, Israel’s favorite Egyptian, running this country, and running the army to run this country? We’re going to have just another benevolent military dictator running another army which runs another country in the Arab world, which is basically what we’ve had all along. So, the protesters, who tend to be about 24 hours behind in working this sort of thing out — they’re awful tired, and they’re trying to stay alive and so on — they’re going to have to struggle hard to make sure that the political future belongs in their hands and not in another bunch of generals who grew up under Mubarak and got tired of his rule. Because the army is against Mubarak, which I think it pretty much is now, does not mean that the army is going to support wonderful, free, open elections in Egypt. It will be nice to think so, but I can’t think of an army that’s ever actually done that in history, certainly not in Egypt. So I think that these are the questions that are going to come up. And it’s been interesting watching the behavior. I mean, I’m right up right next to the tanks and, you know, where stones are falling and so on. Yesterday, for example, a young soldier was standing in tears as the stones went in both directions past him. And he was obviously torn apart by what he should do between his duty as a soldier and his duty as an Egyptian. And in the end, he jumped down from the tank, right in front of me, crying and throwing his arms around one of the protesters. And that — you know, that was a very significant moment, I thought, in this. You know, if big history is made on the streets, this was a little tiny microcosm of what was actually going over. The army are against Mubarak. I think that’s what’s going to come across in the next 24 hours. AMY GOODMAN: That was Robert Fisk, the longtime Middle East correspondent of The Independent newspaper in London. He’s based in Beirut, but of course speaking to us from the streets of Cairo.